If you’ve spent any time in an office environment, you know that there are a few pieces of equipment in such an environment that people covet. Sure, everyone likes to have a nice Swingline stapler, and a decent computer, and a few other niceties. But if you’ve spent more than a few hours sitting in an office in your life, you know that the one piece of equipment that really matters, no matter what people may think, is the office chair. A good office chair can be a real blessing, while a bad office chair can make your work day a nightmare. But how do you pick a good office chair? Well, if you’re in the kind of cutthroat office where the equipment is given out on the basis of who claims it first, then you can get a decent office chair by waiting until a team lead, project manager, or someone similar loses their position, and then getting their chair as soon as it’s free (hopefully before personnel takes it back). But, if you’re looking to get your own office chair, whether at home or for office uses, you are going to want to look to a guide that will help you to pick out the best office chair for you. Luckily, this is just such a guide! 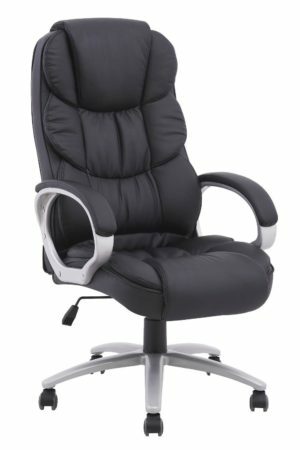 Now, before we begin to discuss, in depth, what office chair might be the best for you, what office chair you are going to want to turn to when you need support, let us first present you with a nice little guide, one that will allow you to pick out the office chair you’re looking for, or at least to narrow down your search. Here are just a few of the office chairs vying for the title of ‘best ergonomic office chair’. So without any further ado, here are some of the best ergonomic office chairs right now. Hopefully, this table gave you a decent idea about the products we’ll be reviewing, maybe even giving you a bit of an idea about which ones you’ll want to pay extra attention to when making your purchasing decision. Picking good ergonomic chairs for back pain will mean that you spend more time at work thinking about what you’re doing, and less time worrying about a nagging injury, and that can only be a good thing. So, without further ado, let’s take a look at the products we reviewed. Amazon is a business that is expanding with each passing day. Seeing as they are popular among businesses both large and small for everything from purchasing staplers to purchasing copy and fax machines, it only made sense that at some point they would end up getting into the office furniture game. And as with everything that Amazon has done, their AmazonBasics line is actually far better than you would think it would be for the price. Amazon seems to have mastered, in general, the idea of getting you a good product at a decent price, even if that means hooking you up with someone else who is offering the same goods that they are, so this shouldn’t really be a surprise. Anyhow, this is a great office chair if you’re into the high-backed office chair idea. Now, not everyone is; some people say that it hurts their neck, some people want a bit lower back or lumbar support, but if you’re the kind of person who likes a high-backed office chair, this is definitely one worth considering. The chair proper is made of two materials; luscious bonded black leather, and PVC. Not the kind of PVC you would find in pipes, though, polished and molded PVC that actually looks impressive. How good is the leather? Well, that depends on what you know of leather. If you’re the kind of person who can afford rich Corinthian leather, then you might not find this leather impressive (then again, if you’re the kind of person who can afford Corinthian leather, why would you be reading this instead of having someone else buy you the right office chair?). But for the average denizen of the office, this chair will be a delight and one that looks very nice. 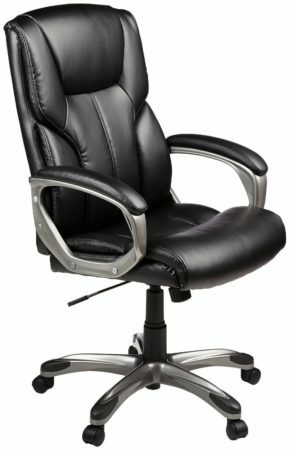 So, if you are looking for a reasonably priced ergonomic office chair for your office or just for your home use, the AmazonBasics high-back executive chair is a great choice and a great selection from among the ergonomic office chairs that are on the market. If you’re in the market for a basic office chair, one that looks like it could be seen in a cubicle in the fanciest of businesses in the world, then look no further; the Office Factor executive office chair is here to fill that niche for you. As far as ergonomic chairs, go, it’s not the fanciest, sure. It isn’t so much built to be impressive, as it is to be somewhat comfortable. It’s not got a bit of leather, but it is lower grade than the leather found in the AmazonBasics line, and the truth is that this leather is also a bit more utilitarian. But please, do not take this to mean that I don’t think that this office chair is up to snuff. 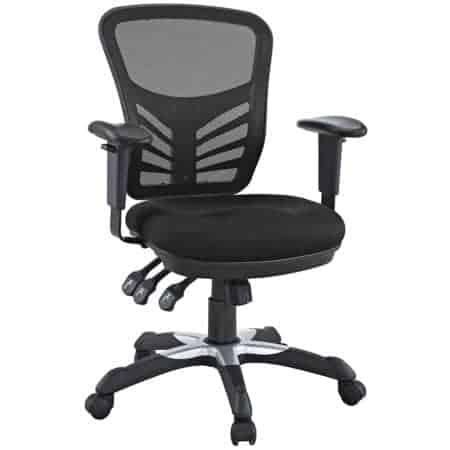 Quite the contrary; this chair offers everything you could want in an office chair and more. To begin with, due to the intelligent and ergonomic design, it gives you a lot more lower back support than many of the other offered models. This is great, especially if you have a job that requires you spend a lot of time sitting in the same area. The back of the chair is a lot taller than usual, too, which is another benefit. Believe it or not, that taller backing, along with the tapered design, means that you are getting a decent amount of neck support, which will definitely help you to feel your best while you are working, and it helps to remove the worry about various aches and pains and nagging discomfort. If you’re looking for an office chair that is going to look like a luxurious seat, then this probably is not the one that you want to choose. 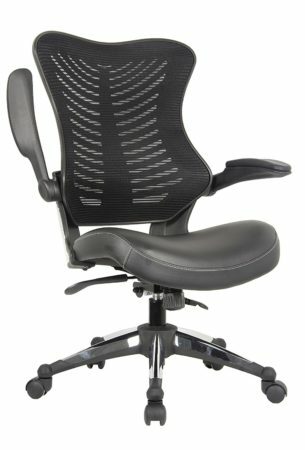 If, on the other hand, you want to look for an office chair that will allow you to feel good while you’re sitting at your desk or workstation or what have you, then this is definitely a chair that you should be considering for your personal use and one you will be glad to sit in for the foreseeable future. High back can be uncomfortable to some. If you have ever sat in a cubicle, you have probably sat in a chair like this. The differences between the chair that you probably sat in and this one, though, are numerous. To begin with, Amazon doesn’t make low-quality and uncomfortable chairs, even though their chairs are competitively priced. The mid-back mesh chair is no exception, and it is designed to be quite comfortable and quite easy to acclimate to. Again, we have a chair that doesn’t have a lot of lower back support or lumbar support. However, sitting in this chair properly can provide all the back support you will ever need, so that is not so much of a worry, thankfully. But if you’re one of those odd and rare birds who likes to have some support for their neck in their chair, then I have bad news for you; this is not the right chair for you. The arm rests are surprisingly well positioned to make sure that you will be comfortable in the long run. A lot of chairs, the armrests are too far down, so that when you are typing or writing or doing anything other than resting, they are not properly positioned for your comfort. These arm rests, though they may not have a nice pad for you to rest on, are positioned just right for the average person to be able to comfortably rest their arms there. The seat, too, is surprisingly well made. A mixture of mesh and foam on top of PVC, this pad is more than enough to support 225 pounds sitting in it, and believe it or not, it manages to seat that much weight quite comfortably. 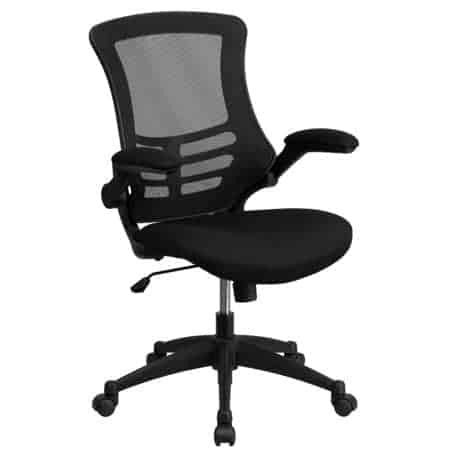 Overall, if you’re looking for a decent mid-sized and mid-back office chair, and one that is pretty standard and without a lot of bells and whistles, this AmazonBasic offering has you covered. If you’d like something a bit more ornate or gaudy, I would recommend that you look elsewhere. Flash furniture is a business that I have literally never heard of before, but just because you haven’t heard of a business doesn’t mean that they cannot make a decent chair, really. And when it comes to making said decent chair, they knocked the ball out of the park with this one. This chair is made entirely out of mesh, PVC plastics, and fire retardant foam. The design helps to make it possibly the best gaming chair that we reviewed, which is nice. 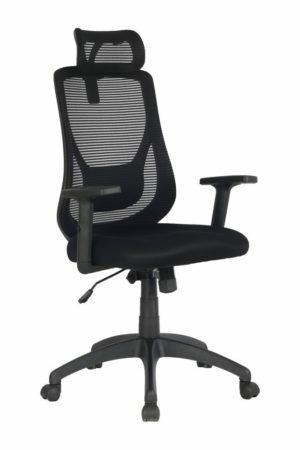 Another nice thing is that the armrests (which are made from a PVC skeleton, with fire retardant foam padding topped by mesh) are just the right height that, for the average desk or cubicle, you will be able to rest your arms on them while typing, which makes this a great computer chair for you to use when you’re in the office, or even when you’re at home doing your taxes or enjoying a bit of gaming in your spare time. Another great asset that this chair brings is that the back seems to be a lot better designed for comfort than that of many of the competitors. Believe it or not, there are a lot of chairs that seem to be built for either the short or the tall; this one seems to contour to the back of the average person a lot better, which means that it is going to be a lot more likely to support your back well. This means more time spent on the job, and less time being spent looking for some Ibuprofen or something else to help you to deal with the back pain that you’ll be experiencing from a chair that might not be supporting your back as well. All things considered, this is a good chair. Sure, it may not have the stylish flair of a chair that is made with some luscious leather, but where the chair really earns its money is back support and this chair supports the back very well indeed. If you flew a lot on jets back in the early 00’s, you probably saw that a lot of 737’s had chairs that looked suspiciously like this in their first class cabin, albeit it with much thicker armrests. Now, you can get the same kind of comfort in your office. No, that’s not a joke, either. Some airliners actually have great chair designs, believe it or not. This chair looks like the kind of chair that you find in the office of a mid-level executive, or in the cubicle of a senior member of staff or a team or program lead. This is the kind of chair that someone who has spent quite some time at their desk would pick, and for a variety of reasons. To begin with, leather has long been accepted as a symbol of power in the business world. The best executives have fine leather shoes, often hand-made, for example. That being the case, if you’re looking to project that you’re a leader (or a follower who is ready for consideration as a leader) then spending a bit of money on your own leather office chair is not a bad idea. Leather is also and has always been, a bit more fashionable of a choice for those who are looking to get a nice chair and also look professional. The arm rests are a little bit lower than those on other chairs, but they are still well positioned for almost any purpose that you may have. They’re not very well padded, either, which is not the best thing for those of you with sensitive arms, but really, if you’re that reliant on having a decent bit of padding on your arm rests, you probably aren’t using your arm rest right. As always, AmazonBasics delivers a decent product that is also very able to meet your needs. Definitely, something that you will be happy that you spent money on, and not a product that you will regret purchasing. LexMod is a business that actually makes quite a few products that you can find in the office, and they make them pretty well. Their mesh office chair is no exception. However, that being said, if you’re looking for a very tall-backed office chair that will give you a lot of neck protection and neck support, this is probably not the office chair for you. It also isn’t the office chair for you if you are looking for one that will be able to provide you with a lot of lower back and lumbar support. For some reason, a lot of the businesses out there that make office furniture seem to be wed to the idea of having no support for the lower back, and the LexMod doesn’t do anything to fix that. Some have said that the reason behind this is the fear that this support might make people more apt to napping in the office, but who knows the real reason? This chair is a nice combination of bonded black leather, mesh, and a bit of foam padding. It is also a lot more adjustable than other, models, with many more options than the other chairs in the list. 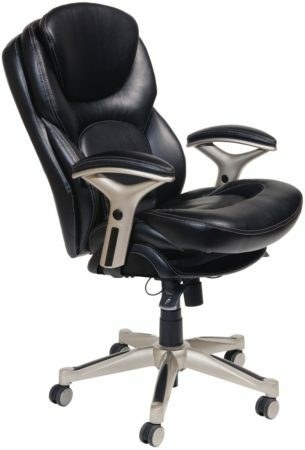 However, just because there are more adjustability options does not make it a better chair, for those who are wondering. If you are looking for an extremely comfortable chair that will also provide you back support and has thick padding on the armrests, this is not the chair for you. However, if you’re just looking for a good office chair that will provide you a decent amount of comfort, this one will work out just right. It’s not among the best computer chairs for gaming, but that doesn’t mean it isn’t a decent choice. Most of us know the name Serta for their mattresses, and for their insistence on using weird looking Claymation sheep in advertising their mattresses that were obviously designed by the same people who did Wallace and Gromit shorts back when they were still popular. However, Serta makes quite a few other products. And as with all things Serta does, the obvious emphasis is on comfort and ensuring that the person using the product is going to be able to enjoy it fully. That means, of course, that price may be quite a bit higher than comparable chairs (and let’s face it, Serta doesn’t do much cheap. If you don’t believe me, take a second and take a look at the prices that they have on their various mattresses, and then compare them to the prices on other models. To begin with, this thing looks a lot nicer than most of the more price-conscious models that are available out there. Furthermore, the Serta offering here is a lot more likely to allow you to be comfortable than a lot of other offerings, and they padded the chair like you wouldn’t believe. Heck, even the armrests have padding and on the top of the padding is more luscious leather. Seems like a good design to me! The whole chair proper is actually made of leather and padding, which is a nice touch and one that provides the ultimate in comfort available. Even better, it is designed to offer lower back support, which is a lot more than most of the chairs on this list can say for themselves. The Serta is more expensive, as would be expected, but if you’re looking for the best office chair that money can buy, this is definitely the way to go. It is probably the best ergonomic office chair for back pain, as well as the best office chair for lower back pain in particular, that we reviewed on this list. 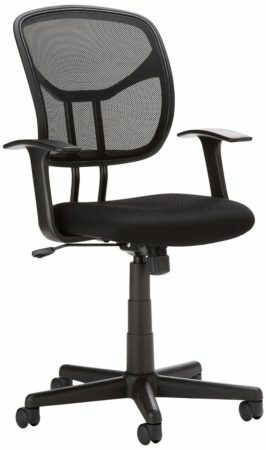 Truly, Serta has crafted a great ergonomic computer chair that anyone would be glad to have in their office. VIVA has a simple entry for those of you looking for support for your neck. Realistically, that is not a whole lot of you, seeing as most people tend to kind of hunch forward when they’re writing, but hey, if you need neck support, it’s nice to see that someone is there willing to provide you a chair that will give you all the neck support that you could ever need. This is a very simple chair, with a very bare-bones design. It has an adjustable neck support, and that neck support is the real draw. It has a decent amount of upper and mid-back support, but when you get into things like the lumbar and lower back, support is not nearly as much as it could be. What about the armrests? Well, they’re just kind of flimsy. If you use them too much (or lean too heavily on them), then you’re going to be uncomfortable. The padding just isn’t there. If you need that neck support, then I would recommend this offering. If you don’t, then you should probably look elsewhere for your ergonomic office chair needs, as this is a pretty plain offering. For the record, Best is part of the name, not a declaration that this is actually the best office chair. That being said, they do a pretty good job at making a run for that title, to be sure. This list is pretty low on high back office chairs to begin with, and even when we found some, the vast majority of them were of the ‘mesh’ variety, and not a lot of them had the comfort of a leather surface. This is the chair that challenges that mold. It also seems like, to me, the vast majority of the chairs we reviewed decided that you were either getting upper back and neck support, or you were getting lower back support. This chair offers a great combination of both, and even better, it makes sure that you also get a decent amount of padding and some decently fashionable covering for all that padding. Most definitely a chair that anyone should be happy to have. If you’ve come to this article, you are probably already considering buying an ergonomic office chair. Whether you’re looking for one to help you cope with a recent injury, or just looking at one to make sure that you take care of your back while working, you probably have some questions. Here are some answers. Does Neck Or Back Support Matter More? Honestly, it all depends on how you sit. In general, though, it would be better to have back support than neck support, unless you have actual issues already. Consult a chiropractor for more information about what your particular needs are. Leather is not only comfortable on the skin but in many settings, it is a sign of leadership or power. Really, it’s a sign that you’re willing to spend a bit more money than other people are, in order to be a bit more comfortable than they are going to be. Leather is infinitely more comfortable than the vast majority of other materials, especially against the skin. We’ve had some fun today, looked at a few nice chairs, and hopefully, you’ve learned a thing or two about the chairs that you may be looking to buy for your own uses. However, we’re here to find the best ergonomic office chair for you, and that’s what we’re going to do. 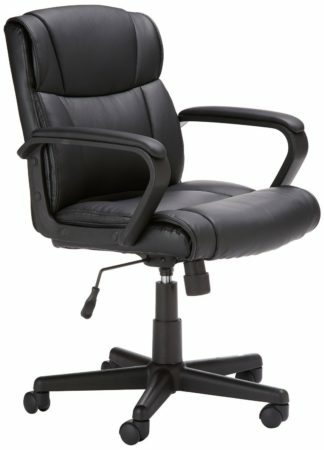 Now, although AmazonBasics offered us some great options for those looking to stay in the affordable range, and there were a number of decent offerings, if you are looking for the best chair, the most comfortable office chair that we reviewed, then there is only one option that we can look at. The best office chair 2018 has to offer you is the Serta 44186. Well, it covers all the bases. Does it look good? Check. Does it have a very comfortable material? Check. Does it provide upper back and neck support? Check. Does it have good support for your lower back? Check! This chair has everything you could need, but it does require a bit of extra cost to attain all that comfort. So, if you’re looking for a great chair, hopefully, this guide has provided you some assistance. Whatever chair you choose, may it provide you comfort in the office or at your desk for years to come!